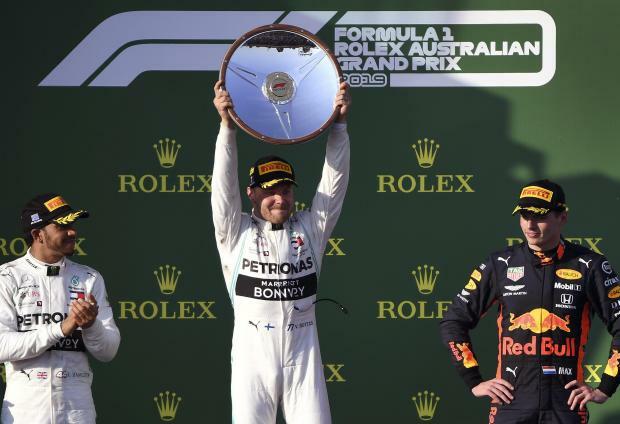 Valtteri Bottas upstaged his Mercedes world champion team-mate Lewis Hamilton to blitz the field and win the season-opening Australian Formula One Grand Prix in a sizzling performance Sunday. "How about that! Yes!" said Bottas over the team radio after also taking the new bonus point for the fastest lap of the race. "Thank you guys." Bottas was overshadowed last year by Hamilton, failing to win a race, hampered by mechanical problems and bad luck but was fast in qualifying and only narrowly edged out of pole position. Bottas, now in his third year with Mercedes, knows he must perform with promising Frenchman Esteban Ocon, 22, waiting in the wings as the team's reserve driver. He delivered in spades on Sunday for his fourth Grand Prix win in his 119th race. Driving on soft tyres on a fine day, he got an electric start and built a gap of 1.153 seconds on Hamilton after the opening lap, with Vettel, Verstappen and Leclerc trailing in their wake. "I don't think I'm going to make it to the end on this tyre," added the frustrated world champion.